The Medical Association recently joined the American Medical Association and 85 other national medical groups and state medical associations in sending a letter to the Centers for Medicare & Medicaid Services to urge CMS to provide guidance to Medicare Advantage plans on prior authorization processes through its 2020 Call Letter. In the jointly signed letter, the groups call upon CMS to require MA plans to selectively apply PA requirements and provide examples of criteria to be used for programs such as ordering/prescribing patterns that align with evidence-based guidelines and historically high PA approval rates. Citing the CMS Patients Over Paperwork initiative, the letter stresses this new guidance will promote safe, timely and affordable access to care for patients; enhance efficiency; and reduce administrative burden on physician practices. The letter further explains how the prior authorization process has been found to be burdensome for health care providers, health plans and even patients and that physicians and insurers have agreed that these policy changes to eliminate PAs on those services for which there is low variation in care can promote greater transparency regarding services subject to PAs and protect patients to ensure PAs do not impact the continuity of care. PA programs can create significant treatment barriers by delaying the start or continuation of necessary treatment, which may in turn adversely affect patient health outcomes. According to a 2018 AMA survey of 1,000 practicing physicians, 91 percent of physicians said PAs can delay a patient’s access to necessary care. These delays may have serious implications for patients and their health, as 75 percent of physicians reported that PA can lead to treatment abandonment, and 91 percent indicated that PA can have a negative impact on patient clinical outcomes. Most alarmingly, 28 percent of physicians indicated that PA has led to a serious adverse event (e.g., death, hospitalization, disability/permanent bodily damage) for a patient in their care. Alabama Sen. Doug Jones introduced legislation this week to give a second chance to expand Medicaid to those states that have not yet expanded their programs. The States Achieve Medicaid Expansion (SAME) Act would also give these states another opportunity to receive the same levels of federal funding that was offered in 2010. Originally in 2010, there would have been federal funds to cover the full cost of expansion for three years for those states that expanded their Medicaid program, at which time federal coverage would drop to 90 percent and states would cover the rest. Should the SAME Act pass, full funding would be offered for three years before decreasing to 95 percent funding in the fourth year, 94 percent in the fifth and 93 percent in the sixth. Federal coverage would stand at 90 percent every year thereafter. The Medical Association remains an advocate for not only fully funding Alabama’s Medicaid program but also agrees with expansion of the program. Medicaid is a state-run program providing health coverage for about 23,000 low-income residents. To qualify for current Medicaid coverage, families with children must have a household income at or below 18 percent of the poverty level. Expanding the program would take that threshold up to 138 of percent the poverty level, offering access to as many as 325,000 Alabamians. Effective for dates of services on or after Feb. 1, 2018, fee-for-service delivery claims for recipients who reside in a county not served by an Alabama Medicaid (Medicaid) Maternity Care Program must contain the date of last menstrual period and the date of first prenatal visit. This information is not required for hospital claims. Claims without the date of last menstrual period and the date of the first prenatal visit will receive a “soft” denial. This means the claim will process, but the provider will receive an alert to remind them to include the information. On Feb. 1, 2019, claims that do not include the date of last menstrual period and the date of the first prenatal visit will be denied. How can a fee for service provider submit a claim? 2. Enter QUAL the value “484” to identify the information in block 14 as the date of the last menstrual period. 5. If no prenatal care was received, the date entered in block should be the date of the first contact during the pregnancy. *Reminder: Medicaid requires all claims be filed electronically unless they are required to be submitted on paper. PES does not currently allow claims to be submitted with this information, but a software upgrade will be available prior to claims denying for not containing the information. Providers within the Maternity Care Program must continue to follow guidelines outlined in the April 13, 2017 ALERT. Please visit http://medicaid.alabama.gov/alert_detail.aspx?ID=12209 for a copy of the ALERT. Please direct questions to the Fiscal Agent, Provider Assistance Center at (800) 688-7989. The passage of the Bipartisan Budget Act of 2018 requires states to “cost avoid” claims for prenatal services when there is a known liable third party. Prior to this change, states were federally required to “pay and chase” claims with a designated prenatal procedure or diagnosis code. The federal “pay and chase” provision enabled providers to bill Medicaid for prenatal care and receive payment without having to bill the other third party. Medicaid was required to seek reimbursement from the other liable third party. Because of this federal change, the Alabama Medicaid Agency will implement changes within its claims processing system to require providers to bill other known insurance coverage prior to receiving Medicaid payment for prenatal services. Effective Jan. 1, 2019, for prenatal services claims received for dates of services on or after Feb. 9, 2018, Alabama Medicaid will deny claims when there is other insurance coverage, but no payment or denial by the other insurance is indicated on the claim. Once the provider has billed the third-party carrier, if a denial is received or a balance remains, the provider may then submit the claim to the Alabama Medicaid Agency for consideration of payment. Effective Nov: 1, 2018, the Alabama Medicaid Agency will begin implementing limits on short-acting opiates for opioid naïve recipients. The Agency defines “opioid naïve” as a recipient with no opioid claim in the past 180 days. Any claim for a short acting opioid for an opioid naïve recipient exceeding the maximum days’ supply limit or MME limit will be denied. Claims prescribed by oncologists will bypass the edit. Long term care and hospice recipients are excluded. Refills of remaining quantities and/or new prescriptions filled within 180 days of the initial opioid naive claim will require an override. Refills of remaining quantities of prescriptions that are partially-filled will be allowed per State and federal law* but will require an override through Medicaid. See below for more details from the State Board of Pharmacy. For adults, the refill of the quantity remaining on the partial fill will not count towards the prescription limit if filled within 30 days of the original prescription. Monthly maximum unit quantities still apply. Overrides for quantities exceeding the maximum days’ supply limit or MME limit may be submitted to Health Information Designs (HID). Please see the Pharmacy Override External Criteria Booklet for information about override requirements. Please refer to the following link for more information regarding overrides for opioid naïve patients:http://www.medicaid.alabama.gov/content/4.0_Programs/4.3_Pharmacy-DME.aspx. A Recipient Information Sheet for prescribers and pharmacists to provide to recipients can be found athttp://www.medicaid.alabama.gov/content/4.0_Programs/4.3_Pharmacy-DME.aspx. A link with more information regarding MME calculations is https://www.cdc.gov/drugoverdose/pdf/calculating_total_daily_dose-a.pdf. Incomplete requests or those failing to meet Medicaid criteria will be denied. If the prescriber believes medical justification should be considered, the prescriber must document this on the form or submit a written letter of medical justification along with the override form to HID. Additional information may be requested. Staff physicians will review this information. Any policy questions concerning this provider ALERT should be directed to the Pharmacy Program at (334) 242-5050. Questions regarding override procedures should be directed to the HID help desk at 1-800-748-0130. Effective Nov. 1, 2018, the Alabama Medicaid Agency will begin implementing limits on short-acting opiates for opioid naïve recipients. The Agency defines “opioid naïve” as a recipient with no opioid claim in the past 180 days. Any claim for a short-acting opioid for an opioid naïve recipient exceeding the maximum days’ supply limit or MME limit will be denied. Long-term care and hospice recipients are excluded. Overrides for quantities exceeding the maximum days’ supply limit or MME limit may be submitted to Health Information Designs (HID). Please see the Pharmacy Override External Criteria Booklet for information about override requirements. Please refer to the following link for more information regarding overrides for opioid naïve patients: http://www.medicaid.alabama.gov/content/4.0_Programs/4.3_Pharmacy-DME.aspx. A Recipient Information Sheet for prescribers and pharmacists to provide to recipients can be found at http://www.medicaid.alabama.gov/content/4.0_Programs/4.3_Pharmacy-DME.aspx. Pharmacy override requests for quantities exceeding the maximum days’ supply limit or MME limit may be submitted to Health Information Designs (HID). Please see the Pharmacy Override External Criteria instructions for information about override requirements at: http://medicaid.alabama.gov/content/9.0_Resources/9.4_Forms_Library/9.4.13_Pharmacy_Forms.aspx. The Override Request Form is to be used by the prescriber or the dispensing pharmacy when requesting an override. The form can be found at: http://medicaid.alabama.gov/content/9.0_Resources/9.4_Forms_Library/9.4.13_Pharmacy_Forms.aspx. Brookwood Baptist Medical Center, the second largest hospital in the metro Birmingham area, received an 11th-hour reprieve Thursday night with regulators from the Centers for Medicare and Medicaid Services accepted the facility’s action, thus allowing the hospital to continue its Medicare and Medicaid billing privileges. However, the facility is not out hot water just yet. “The immediate jeopardies have been removed at this time, but the hospital remains in noncompliance status and must work to correct the deficiencies cited to protect the health and safety of the facility’s patients,” according to a CMS statement, which also noted the survey review process can be extended over the next 60 days. Brookwood Baptist CEO Keith Parrott said the hospital will continue to fully participate in the Medicare and Medicaid programs without further interruption. Even a short-term interruption in participation could pose a significant financial challenge given the large amount of revenue and jobs at stake. Parrott also said the hospital will be resurveyed in the future. In May, Brookwood Baptist received a notice stemming from an April incident in its psychiatric unit. The May CMS order was rescinded after a follow-up inspection determined Brookwood Baptist was in compliance with guidelines. Brookwood Baptist received a termination notice in late July that gave the hospital until Aug. 9 to become compliant with CMS guidelines pertaining to government body, patients’ rights and nursing services. It was the second notice the hospital has received this year. According to CMS, Brookwood’s immediate jeopardy notice was based on “the hospital’s failure to staff to implement its elopement policy resulting in the death of one patient; failure of staff in the telemetry monitoring unit to notify registered nurses of a patient who had no heart rate for 15 minutes and subsequently died; and a failure of staff to notify the physician of a patient’s low blood pressure readings resulting in the patient being found unresponsive and not breathing. WIC Income Guidelines Increase. Are Your Patients Eligible? Alabama families may qualify for the Special Supplemental Nutrition Program for Women, Infants and Children, better known as WIC. If you are a woman who is pregnant, who had a baby within the past six months, who is breastfeeding, or who is the parent or guardian of a child up to age 5, you are encouraged to apply for WIC at your local county health department or WIC agency. Participants in the program receive free nutrition education and breastfeeding peer counseling support. In addition, participants have the option to receive up to three months of food benefits at a time for each qualified family member. Food benefits are redeemable at WIC-authorized stores throughout Alabama. WIC participants must have both a limited income and a nutritional need. Families who receive Medicaid, SNAP or Family Assistance already meet the income qualifications for WIC. Even families who do not qualify for these programs may be eligible for WIC because of its higher income limits. For more information, please go to http://www.alabamapublichealth.gov/wic or call the statewide toll-free line at 1-888-942-4673. What If No One Was On Call [at the Legislature]? In times of illness, injury and emergency, patients depend on their physicians. But what if no one was on call? Public health would be in jeopardy. However, the same holds true for the Legislature. During the 2018 session alone, if the Medical Association had not been on call advocating for you and your patients, unnecessary and costly standards of care would have been written into law, lawsuit opportunities against physicians would have increased and poorly thought out “solutions” to the drug abuse epidemic ─ that could’ve made the problem worse ─ would have become law. Keep reading to find out more. The 2018 Legislative Session is over, but continued success in the legislative arena takes constant vigilance. Click here to download our 2018 Agenda. If no one was on call…increased state funding for upgrading the Prescription Drug Monitoring Program (PDMP) would not have occurred. Working with the Governor’s Opioid Task Force, the Medical Association proposed increased funding for the PDMP, to allow it to be an effective tool for physicians. As a result, the Task Force made the request its number one recommendation to the Governor and the 2019 budget for the Alabama Department of Public Health (the PDMP administrator) has a $1 million increase for making a long-overdue upgrade to the user-friendliness of the drug database. If no one was on call…legislation helping veterans at-risk for drug abuse get the care they need and also leverage technology to combat the drug abuse epidemic would not have occurred. Through enactment of SB 200, the prescription information of VA patients will be shared between the VA and non-VA physicians and pharmacists who are outside the VA system, the same kind of information sharing of prescription data that exists for almost all other patients. Passage of SB 200 also establishes a mechanism for vetting requests for release of completely de-identified PDMP information that can be used to spot drug abuse trends and help state officials better allocate resources in combatting this epidemic. The proposals that resulted in the drafting of SB 200 originated with a recommendation from the Governor’s Opioid Task Force, one the Medical Association supported. If no one was on call…the concerns of physicians regarding the current state of affairs surrounding the Maintenance of Certification program would not have been heard. A formal recommendation from the Medical Association’s MOC Study Committee resulted in the enactment of SJR 62 by Senators Tim Melson, M.D., Larry Stutts, M.D., and the entire Alabama Senate. The resolution was signed by Gov. Kay Ivey. SJR 62 vocalizes Alabama physicians’ frustrations with MOC and urges the American Board of Medical Specialties to honor its commitment to help reduce the burden and cost of MOC. Pursuit of a legislative resolution was just one of several recommendations from the Association’s MOC Study Committee this year. If no one was on call…the Board of Medical Scholarship Awards could have seen its funding reduced but instead, the program retained its funding level of $1.4 million for 2019. The BMSA grants medical school loans to medical students and accepts as payment for the loan that student’s locating to a rural area to practice medicine. The BMSA is a critical tool for recruiting medical students to commit to practice in rural areas. As well, the economic footprint of every physician is at least $1 million, which improves both community health and local economies. If no one was on call…Medicaid cuts could have been severe, possibly reducing access for patients within an already fragile system in which less than 20 percent of Alabama physicians participate. The 2019 budget has sufficient funds available for Medicaid without scheduled cuts to physicians. However, increasing Medicaid reimbursements to Medicare levels could further increase access to care for Medicaid patients and remains a Medical Association priority. While Alabama’s medical liability laws have fostered fairness in the courtroom and improved the legal climate, each year personal injury attorneys seek to undo parts of the very law that helps keep “jackpot justice” and frivolous suits in check. If no one was on call…bill language that could have pulled physicians into new lawsuits targeting opioid drug makers and opioid wholesale drug distributors could have been included in the final version of the legislation, whose subject matter was originally limited to placing new criminal penalties on unlawful possession, distribution and trafficking of Fentanyl. After the liability language was added on the House floor, a committee of the House and Senate removed the new cause of action language that could have affected physicians. Additionally, an unsuccessful attempt was made to amend this same bill to give law enforcement the authority to determine what is the unlawful “prescribing” or “dispensing” of prescription drugs. The final bill that passed contained neither of these elements that would have been problematic for physicians. If no one was on call…physicians and medical practices could have been forced to provide warranty and replacement coverage for “assistive medical devices.” As originally drafted in the bill, the term “assistive medical devices” was broadly defined to include any device that improves a person’s quality of life including those implanted, sold or furnished by physicians and medical practices like joint or cochlear implants, pacemakers, hearing aids, etc. However, the Medical Association successfully sought an amendment to remove physicians, their staff and medical practices from having any new warranty or assistive device replacement responsibility under the act, and the final version doesn’t expand liability on doctors. If no one was on call…legislation granting nurse practitioners and nurse midwives new signature authority outside of a collaborative practice and for some items prohibited under federal law – thereby significantly expanding liability for collaborating physicians – could have become law. The Medical Association successfully sought to ensure that all new signature authority granted to CRNPs and CNMs was subject to an active collaborative agreement and all additional forms or authorizations granted were consistent with federal law, protecting collaborating physicians from new liability exposure. The final bill was favorably amended with this language. If no one was on call…physicians could have been held legally responsible for others’ mistakes including individuals following or failing to follow DNR orders on minors. The language of the final bill does not expand liability for physicians. Every session, various pieces of legislation aimed at improving the health of Alabamians are proposed. At the same time however, many bills are also introduced that endanger public health and safety, like those where the Legislature attempts to set standards for medical care, which force physicians and their staffs to adhere to non-medically established criteria, wasting health care dollars, wasting patients’ and physicians’ time and exposing physicians to new liability concerns. If no one was on call…collaborative practice in Alabama between nurse practitioners, nurse midwives and physicians could have been abolished. The legislation did not pass. Read the joint statement on the bill from the Medical Association and allied medical specialties here. The bill may return next session. If no one was on call…legislation to give law enforcement the authority to determine what is the unlawful “prescribing” or “dispensing” of controlled substances (and making violations a Class B Felony) could have become law. The Medical Association sought changes to the bill to require prosecutors to have to prove beyond a reasonable doubt that a physician knowingly or intentionally prescribed controlled substances for other than a legitimate medical purpose and outside the usual course of his or her professional practice, and also to ensure sufficient qualifications for expert witnesses. The sponsor however – arguing that expert witness testimony for prosecuting a physician should not be required – asked the bill not be passed and instead “indefinitely postponed it,” killing the bill for the 2018 session. The bill will return next session. If no one was on call…marriage and family therapists could have been allowed unprecedented authority to diagnose and treat mental illnesses without restriction. The legislation would also have deleted numerous prohibitions in current law including prescribing drugs, using electroconvulsive therapy, admitting to a hospital and treating inpatients without medical supervision, among other things. The Medical Association offered a substitute bill that (1) ensures all diagnoses and treatment plans made by MFTs are within the MFT treatment context; (2) ensures MFTs cannot practice outside the boundaries of MFT services; (3) prohibits MFTs from practicing medicine; and, (4) ensures all the current prohibitions in state law regarding prescribing of drugs, electroconvulsive therapy and inpatient treatment remain intact. The final bill that is now law contains all of these elements. If no one was on call…legislation creating a new state board with unprecedented authority over medical imaging could have passed. The legislation would have required x-ray operators, magnetic resonance technologists, nuclear medicine technologists, radiation therapists, radiographers and radiologist assistants to acquire a new license from a new state board, a board granted total control over the scope of practice for each licensee. Quality and access to care concerns abounded with this legislation that many saw as unnecessary. The legislation did not pass, but is likely to return next session. If no one was on call…proposals to move the PDMP away from the Alabama Department of Public Health and instead under the authority of some other state agency or even to a private non-profit organization could have been successful. In working with the Governor’s Opioid Task Force, the Medical Association stressed the Health Department was the proper home for the PDMP and the Task Force did not recommend that the PDMP be moved elsewhere. If no one was on call…legislation to place new requirements on and increase civil liability exposure on referring physicians under the Women’s Right to Know Act could have become law. The legislation aimed to provide a woman seeking an abortion with notice that she can change her mind at any time and be entitled to a full refund for not going through with the abortion. The Medical Association sought to fix a longstanding problem that places information-provision requirements on referring physicians under the Women’s Right to Know law. While the Association’s language was adopted, the bill failed to pass. The bill is expected to return next session. If no one was on call…state law could have been changed to require mandatory PDMP checks on every prescription. Attempts to change this are expected in 2019. If no one was on call…law enforcement could have been granted unfettered access to the prescriptions records of all Alabamians. Attempts to change this are expected in 2019. 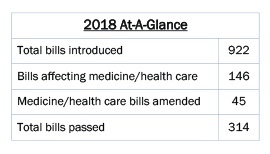 Rural physician tax credits…legislation to increase rural physician tax credits and thereby increase access to care for rural Alabamians did not pass but will be reintroduced next session. Infectious Disease Elimination…legislation to establish infectious disease elimination pilot programs to mitigate the spread of certain diseases failed to garner enough support to pass this session. Data breach notification…relating to consumer protection, is known as the “data breach bill.” In the event of a data breach by a HIPAA-covered entity, as long as the entity follows HIPAA guidelines for data breaches and notifies the attorney general if the breach affects more than 1,000 people, the HIPAA-covered entity is exempt from any penalties. Now, only North Dakota lacks a “data breach” notification statute. The bill was signed by the Governor. School-based vaccine program…a Senate Joint Resolution urging the State Department of Education and the Alabama Department of Public Health to encourage all schools to participate in a school-based vaccine program passed in 2018. The Medical Association, Alabama Academy of Pediatrics and Alabama Academy of Family Physicians issued a joint statement in opposition to the resolution. “While we remain committed to increasing vaccine rates in Alabama for the very reasons outlined in the “Whereases” of the resolution, we are very concerned about the potential disruption that a widespread school-based program could bring to local practices and the likelihood of detrimental effects of adolescents not visiting the doctor-their medical home–during the critical teen years,” the joint statement from the medical societies reads. While Gov. Ivey did not sign the resolution, it was ratified under state law without her signature. Workers comp…legislation to penalize an individual from obtaining workers comp benefits by fraudulent means was introduced this session. The Medical Association successfully sought an amendment to require notice to the physician of termination of a worker’s benefits and to ensure continued payment of claims submitted by a physician until that notice is received. The bill failed to see any action this session. Genital mutilation…legislation criminalizing the genital mutilation of a minor female was introduced this session. The Medical Association successfully sought an amendment to exclude emergency situations and procedures. The bill died in the Senate during the last days of the session. It is expected to return next year. If the Medical Association was not on call at the Legislature, countless bills expanding doctors’ liability, placing standards of care into state law, lowering the quality of care provided and diminishing the practice of medicine could have passed. At the same time, positive strides in public health – like new funding for a much-needed PDMP upgrade, better data-sharing with VA facilities and the resolution on MOC – would not have occurred. The Medical Association is Alabama physicians’ greatest resource in advocating for the practice of medicine and the patients they serve.